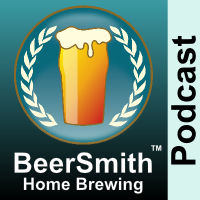 Top beer brewing authors John Palmer and Randy Mosher join me for a special episode #100 to answer some of your questions about brewing better beer. John is the author of the popular “How to Brew” book and video series and Randy Mosher has made a splash with his new book “Mastering Homebrew”. Randy Mosher and John Palmer join me for a special episode #100. John is the author of How to Brew (Amazon affiliate link) as well as the How to Brew video series. Randy Mosher is author of the great new book Mastering Homebrew as well as Radical Brewing (Amazon Affiliate links). We start with a discussion of where the cidery taste comes from in some extract beers – and whether it really comes from using too much sugar in your beer. Randy and John share their thoughts on liquid yeast versus using dry yeast for brewing. Brew-in-a-bag (BIAB) has become very popular, so we discuss some of the advantages of BIAB versus traditional all grain methods. John and Randy share their thoughts on mashing at high water to grain ratios as is done with BIAB, no sparge and some decoctions. We talk about mash pH and both why it is important and also how you can measure and adjust it. Randy and John discuss the use of a single bitterness addition versus a bunch of small boil additions (continuous hopping if taken to the extreme). We discuss simple hop schedules as well as aroma/whirlpool hops. We share some advantages of using whirlpool/steeped hops instead of short boils to preserve delicate hop aromas. John and Randy tackle the need for a secondary versus using a single (unitank or just primary) fermentation. They both provide some tips on beer clarity and how you can improve the clarity of your beer. John and Randy share their approach to simplifying recipe design and using only what is absolutely needed in a beer. They each share their closing thoughts on beer brewing. Thanks to John Palmer and Randy Mosher for appearing on the show and also to you for listening!